Sautee the onions in olive oil till translucent, add garlic. Add the sweet potatoes or yams and let it cook for a minute or two. Add the garbanzo beans and mushrooms. Add some veggie broth and let it simmer for a couple of minutes. Add the coconut milk and cook till the potatoes are soft. Add seasonings and cilantro. When all veggies are cooked add the broccoli florets mix well and turn the heat off. This will preserve the bright broccoli color. 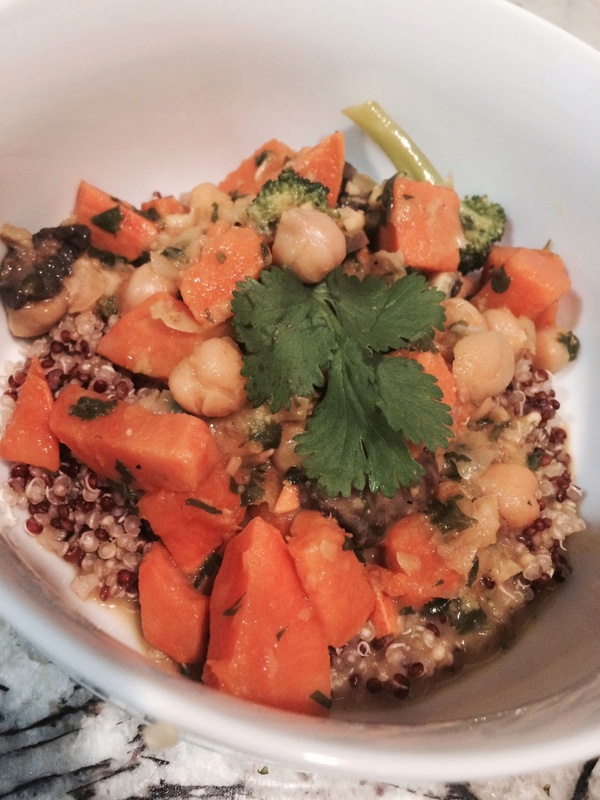 Spoon the quinoa onto bowls and the curry on top. Serve hot and enjoy this delicious warm winter yuminess!